"Birds of a feather flock together" is a well known expression. The expression appears to have surfaced in the 16th century. In 1545, William Turner wrote a version of the expression in the Rescuing of Romish Fox: "Byrdes of on kynde and color flok and flye allwayes together." It is an expression used about people who have similar characteristics or interests, especially ones of which you disapprove and who often spend time with each other. But what about the birds? Why do they flock together? For example in October I received a large number of reports of birds flocking together including three hundred Chaffinch in West Bennan, two hundred and fifty Skylark on Cleats Shore, one hundred Jackdaw in Blackwaterfoot and one hundred Golden Plover at Machriewaterfoot. This is a time of year where birds appear to flock together. At other times of the year birds are fiercely territorial. Even those that breed in colonies defend their own patch. Why do they then flock together? What are the advantages? There seem to be two main advantages, both associated with improved chances of survival. This applies to birds preparing for long migration as well as those who are more residential. The first advantage is safety: more eyes in a flock so more eyes to watch for predators. If a predator does come along and a bird is on its own, it is the target. If the bird is part of a flock of one hundred, there are one hundred targets and the chances of survival are improved. The second advantage is in finding food. Again there are more pairs of eyes looking for food. 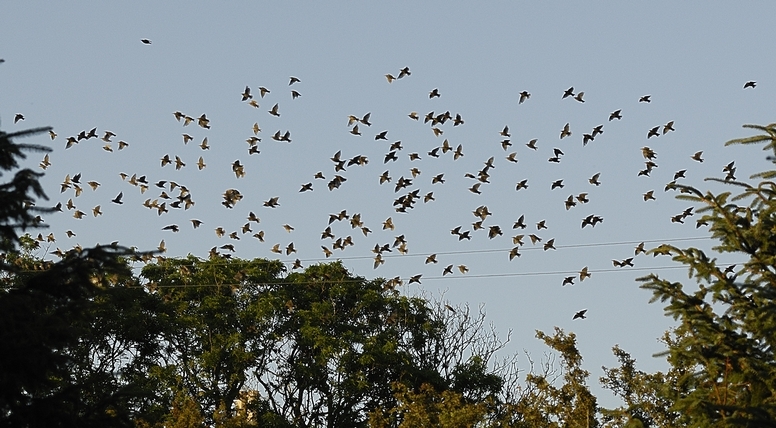 In addition there is increasing evidence that birds that roost together "share information". The mechanism is not clear but one possibility is that older, more experienced birds are better able to find food; hence younger birds roost with them in order to follow their elders to better foraging grounds. Simply by watching and following other birds heading out to forage at the beginning of the day individual birds may pick up where there is more likelihood of finding food.